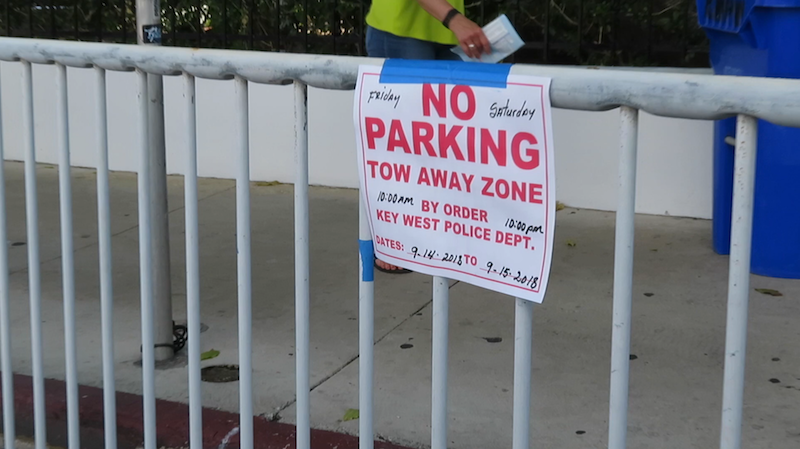 Businesses on Duval Street in Old Town Key West discovered Friday that the City had blocked all parking in front of their shops with uninterrupted rows of barricades. Not exactly friendly to businesses hoping to welcome bikers participating in this year’s Poker Run. 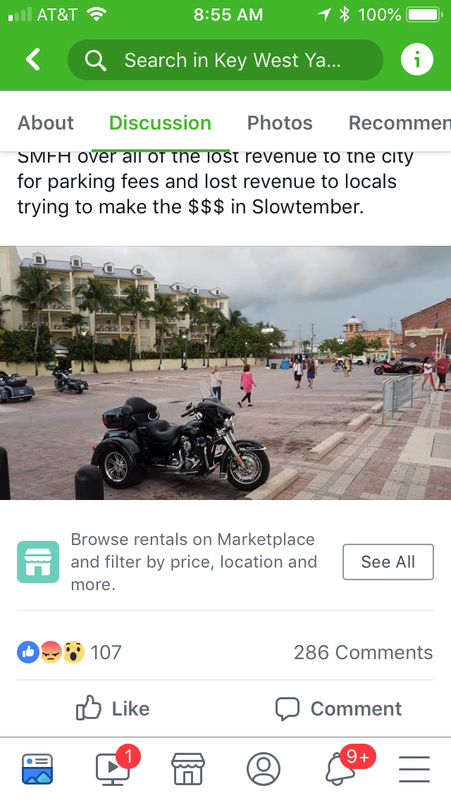 The move created a storm of negative comments on social media fueled by angry shopkeepers and restaurant workers who counted on the Poker Run for extra cash to make it through September. So, what happened? Where are all the bikes supposed to park? Wasn’t there going to be a Poker Run? Well yes and no. 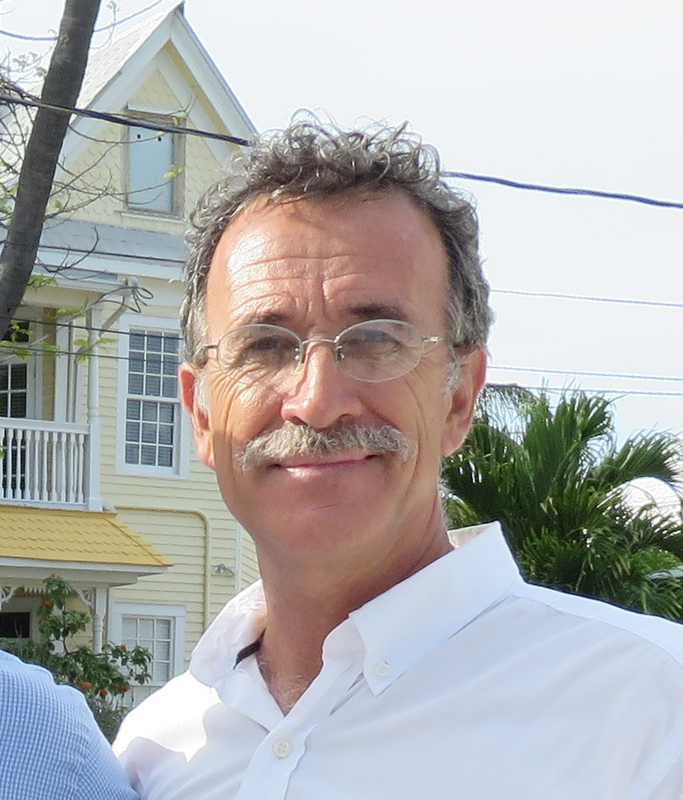 The proceeds of previous Peterson’s Poker Runs were funneled to the Diabetes Research Institute and to the Key West Sunrise Rotary Club. This year the money raised will go to multiple other Florida Keys chapters of the Rotary Club for use for college scholarships. At the September 5th City Commission meeting, City Manager, Jim Scholl, informed Commissioners that no permit was being issued this year for the Poker Run event. But that was not going to be the end of it. Peterson and the Rotary Clubs had decided to have the Poker Run anyway, but this time the final stop would be about 27 miles up the road, at the Boondocks Grille and Draft House on Ramrod Key. If bikers wanted to head down the road another few miles to Key West – it’s a free country. 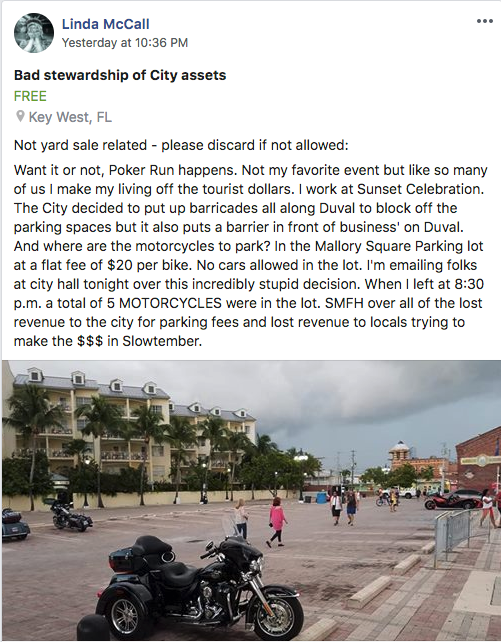 So, a bunch of City workers were told to line up hundreds of barricades along Duval Street, blocking parking, where for decades bikers have been displaying their glittery, thundering, outrageous, and smoking hot machines. So now, here we are on Saturday night. No barbecue stands on the street. No Key West girls blushing at invitations of a ride down Duval. No baffled tourists taking selfies with tattooed, leathered-bearded rebels. According to Peterson attendance is down by half this year. But this little “war” has revealed a much less trivial question about Key West: How desperately fragile the lot of workers in this town has become. How over-stretched many locals still are, a year after Hurricane Irma and how hugely important it is for people on the edge to have that little bonus they counted on. In over 280 comments posted on the Key West Yard Sale Facebook page locals vented their dismay at the City fencing off public parking, a decision perceived as out touch with their difficulties. Is Key West increasingly unfriendly to the event culture that got it out of the hole in the 80’s? Why do we find Fantasy Fest ‘too naked’ and Poker Run ‘too loud’ and Boat Race week ‘too flashy’? The change of heart over the Poker Run came after a bar brawl that took place at the Rumor Lounge on Greene Street, in 2016. Violent crime however can and does occur during other events — or on any normal day for that matter. Jonathan Alvarez’ head was smashed with a bolder during the 2011 Fantasy Fest event. Marques Butler was stabbed to death in the street, again during Fantasy Fest, in 2009. During an ordinary night just last May, a Duval Street hot dog vendor was slashed with a knife by a customer. Peterson points to the fact that in 2016 the City received $30,000 from the Poker Run event organizers. It was meant to cover police services. In early September 2016, local law enforcement received intel that a group of bikers from The Outlaws gang was going to be downtown and picking fights with random people during the Poker Run. The goal was to establish their dominance in a Key West turf war they were fighting with another biker gang, The Pagans. The intel was shared with the Sheriff’s Office and KWPD and leaked to various non-law enforcement people. As planned, a fight broke out downtown the weekend of the Poker Run. Bikers wearing shirts with The Outlaws insignia — a skull with two pistons crossed behind it — started an argument at Rumor Lounge, with the bar owner, about the presence of a black woman. They ordered him to get rid of her. The security camera recorded the violent bar fight and later helped identify one of the aggressors, who was a fire fighter from Bradenton, Florida. After having left the staff bloodied on the floor, the bikers jumped into a taxi and disappeared. Only one police officer was on duty in the area and was unable to stop the aggressors. The Poker Run was blamed for the incident. However, the organizers had payed $30,000 for police security. The police had the intel about The Outlaws intentions, yet only one officer was on duty at the corner of Duval and Green – always the hottest spot on Duval – and where the fight took place. Sheriff Ramsay Takes on Speeding Biker! WHAT’S UP WITH FWC HARASSING LIVEABOARDS LATELY?